Modern '80s and '90s-inspired house is all about weight and space, so a powerful retro bass tone is the way to go. In our walkthrough below you'll notice how we've left space in our main bass's notes, giving the rhythmic pattern time to breathe and creating a brief sense of expectation before the simple riff resolves itself. Although we've then gone on to add new bass tones in these gaps, these extra parts could be saved for only certain key points to step things up later in your track. Our main FM8 layer is heavily drenched in reverb - a feature common for tracks of this style - partly filling in those aforementioned gaps and adding to the overall ambience of the track. Some slight sidechaining is also used, but it's more of a mix tool as opposed to obvious, Prydz-style ducking. 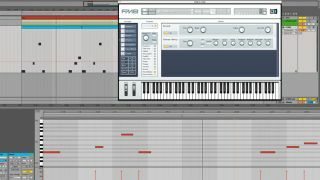 Step 1: Taking inspiration from the classic hollow Detroit bass sound, we load up a square FM bass patch from Native Instruments' FM8 and program in some sparse MIDI notes. The simple percussive sound interplays with the drum groove nicely, and the synth's inbuilt reverb fills gaps with ambience. Step 2: The bass sound is boxy in the mids but lacks low-end weight. Some EQ carves out room for an extra sub underneath, while tape saturation and limiting adds drive and evens out the sound's dynamics respectively. Sidechain compression also ducks the bass under each kick a little. Step 3: A DnB-style Reese bass patch from Rob Papen's SubBoomBass is now layered underneath the mid-range bass to provide low-end power. Our DAW's Utility plug-in sums the channel to mono for consistency in the centre of the mix, and subtle sidechaining is applied to prevent conflict with the kick. Step 4: The bassline is taking shape, but some top-end attack is required to help it cut through the mix more. Rather than processing our mid further, a subtle layer from Native Instruments' Monark adds pluck to the overall bass. Some EQ and delay fit this into the mix. Step 5: Two slightly different variations of a distorted warp sample are placed in the gaps left in our core bass's notes. These provide contrast, and can be brought in later on in the arrangement for variation. Again, EQ and reverb blend these elements in. Step 6: Finally, we add some occasional 808 kick notes in the final gaps to create a subby embellishment between the main groove. These are mainly for impact on a big club system, although you can always add some upper harmonics with saturation if needs be.